Graduation is one of the best times of the school year. It's a time to celebrate a moment of achievement, but also to consider hopes and dreams for what lies beyond the moment. Graduation speeches -- funny, prophetic, inspiring, or just heartfelt, offer a bit of a “time-out” to consider advice for a new generation. More on that subject in a moment, but first, let's acknowledge some good news. In California, more and more students are getting a chance to hear those speeches. High school graduation rates rose in 2016, again, for the seventh year in a row. In 2016, 83.2 percent of students graduated with their class, an improvement of 8.5 percentage points over the class of 2010. We often caution that averages can lie. In this case, however, the trends aren't merely averages. Graduation rates change slowly, but they have risen among students who are poor, as well as among those who are not. 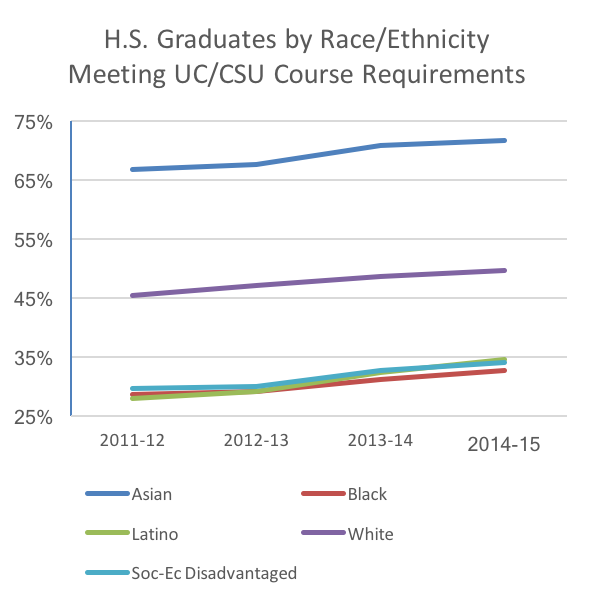 They have risen for students that are black, Latino, white and Asian. If you have been selected to speak at a graduation event, congratulations! The good news is that it is now easy to see hundreds of great examples of commencement addresses, and you can draw on them for inspiration. The bad news, of course, is that these inspiring speeches have raised the bar! Here are some graduation speeches that stand out. Have you seen them? "Do something that gives you satisfaction every day and makes our society a better place... Make sure you give a good measure of your time and your talent and your treasure in service to others. The need to serve others has never been greater in our nation." "I would caution against believing the 'life is short' advice that you should live every day as if it is your last... Hopefully life is long. Do stuff you will enjoy thinking about and telling stories about for many years to come." "These should not be the best 12 years of your life. That is a pain I do not wish upon any of my enemies." "Since we're never going to see each other again, I thought I should share some of my deepest and darkest secrets... I dislike doing homework. Like the Heimlich Manuever, you should do it only when it's absolutely necessary. ...Also, I'm gay." Congratulations to this year’s graduates, and to the moms and dads and educators and others who helped them reach this milestone! Do you have a favorite graduation quote or video? Send us a note and a link!